Situated just off the west shore of Kota Kinabalu in Sabah, the five emerald isles that comprise this park are fringed with white sandy beaches, surrounded by the sparkling aqua waters of the South China Sea. The islands' offshore reefs are filled with exotic corals and sponges and abound in tropical marine life. 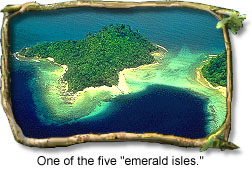 The islands are easily accessible, and each of the five possesses its own particular charms. Pulau Gaya's Bulijong Bay creates the perfect atmosphere for swimming, snorkeling, and picnicking. For hiking and camping, twenty kilometers of graded nature trails weave throughout Gaya's forest, the richest of the five islands in wildlife. Long-tailed macaques, pied hornbills, wild boar, and monitor lizards can be sighted here. Pulau Sapi is the most popular of the islands--its facilities include a large shelter and barbecue area, along with picnic tables and public toilets. A glass bottom boat service is also available. The island of Mamutik provides a back to the basics camping area ideal for those who wish to sample the sensation of being stranded on a tropical island. A jetty and other beach facilities are, however, available. Pulau Manukan, a long island, is said to look like a half-submerged whale basking in the sun. Pulau Sulug is the furthest from the mainland and one of the least developed of all the five islands. Sulug creates a magnificent and abundant display of coral beds and coral heads along its extensive reef rim. Diving and snorkeling among these islands is best off the sheltered southern and eastern shores. Flora Fauna: Shoreline vegetation and dipterocarp forest. Animal life includes bearded pigs, scaly pangolins, rats, squirrels, monkeys, various snakes, and monitor lizards. It is also a good place to see the white breasted sea-eagle, pied hornbill, and the green heron. Nearby coral reefs are ideal for diving and snorkeling. Activities: Trekking, swimming, snorkeling, diving, birdwatching, tennis, squash. There are daily boat services to the islands from Kota Kinabalu main center jetty. During weekdays, boats must be chartered. Most boats accommodate up to 12 passengers.